Natural Service WS Elavation 08/04/2015 09/29/2015 Confirmed 90 days bred to WS Elavation (Tom Smith's great young bull) on 11/11/15, due May 20, 2016. 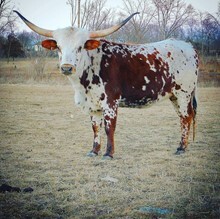 Artificial Insemination Quick Draw 09/18/2014 Confirmed bred to Quick Draw -David Roberts Bull of Roberts Longhorns. Safari is an awesome cow from Wild Horse Creek Ranch. We bought her daughter and liked her so much we had to have the cow. So, Safari became available to us. We love having her in our pasture!